Black and white photograph taken by Jim Garvin, official photographer for the University of Maine in the 1950s and 1960s. 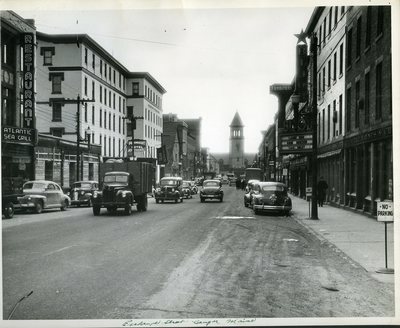 The photograph is labeled, "Exchange Street - Bangor Maine." Business signs visible include the Bijou Theater, where the marquee reads "Ladies Man, Eddie Bracken, Cass Daley," an office of the Bangor Daily News, the Penobscot Hotel, Atlantic Sea Grill Restaurant, and Union Station in the background.